PROPERTY SUMMARY A contemporary, extended detached family home which is situated in a popular residential cul-de-sac location yet within easy access of local shopping amenities, bus routes, recreation grounds and the catchment for both Court Lane and Springfield Schools (subject to confirmation). 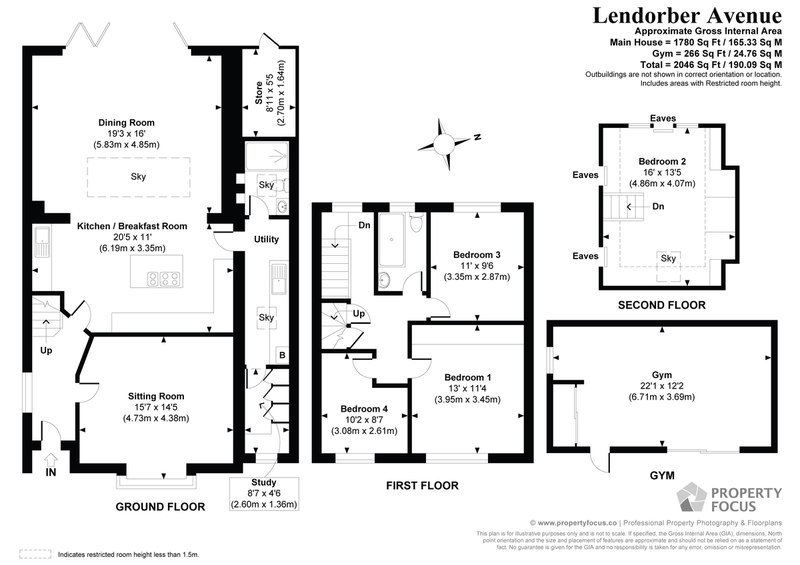 The accommodation is arranged over three floors and has been extended to incorporate a 27' open plan living with dining and kitchen area, separate utility room, shower room, study and sitting room on the ground floor with three bedrooms and a bathroom on the first floor and a further bedroom on the top floor. To the front is off road car parking, to the rear is a low maintenance garden with artificial grass, decked areas and a detached home office/gym which we understand from the owners can be used as an occasional bedroom (having planning consent granted). Offered with a modern day feel, double glazing, tiled underfloor heating on the ground floor (radiators upstairs), early internal viewing is strongly recommended in order to appreciate both the accommodation and location on offer. HALLWAY Tiled flooring with underfloor heating, double glazed frosted window to side aspect, staircase rising to first floor, doors to primary rooms. SITTING ROOM 15' 7" x 14' 5" (4.72m x 4.37m) Double glazed square bay window to front aspect with blinds, power points, resin polished flooring, feature grey internal door with oval glazed panel, wiring for wall mounted T.V with shelving below (Sky connection subject to renewal), underfloor heating, power points. OPEN PLAN LIVING & KITCHEN AREA 27' 10" x 20' 5" (8.48m x 6.17m) Square opening with painted supporting RSJ's, Kitchen area: Comprehensive range of white gloss fronted wall and floor units with chrome handles, pan drawers, wall mounted units, tall larder style units with integrated double oven and storage cupboards over and under, further oven to one side with shelf over and cupboard under, narrow built-in cupboard, central island with six ring electric hob and cupboards under and to either side, power points, separate utility area with integrated dishwasher with matching door, deep work surface with sink unit and range of cupboards, power points, grey door with oval window leading to hallway, tiled flooring, underfloor heating, door to utility room. DINING AREA Skylight window, full width bi-folding doors with blinds leading to rear garden, matching flooring to living room, underfloor heating, spotlights, power points. STUDY 8' 7" x 4' 6" (2.59m x 1.35m) Double glazed frosted window to front aspect, range of floor to ceiling built-in storage cupboards with range of shelving, wood laminate flooring, work desk/station, power points. SHOWER ROOM 1½ size shower cubicle with folding screen to one end and drying area, skylight window, ceiling spotlights, recessed narrow shelving, close coupled w.c with twin flush, contemporary wash hand basin with glass tap and cupboard space under, tiled flooring, radiator. FIRST FLOOR Landing with double glazed window to rear aspect, stairs with low level lighting, understairs storage cupboard with door leading to top floor, doors to primary rooms. BEDROOM 1 13' 0" x 11' 4" (3.96m x 3.43m) Double glazed window to front aspect with radiator under, wood laminate flooring, range of built-in wardrobes to one wall with hanging space and shelving, power points. BEDROOM 3 11' 0" x 9' 6" (3.35m x 2.84m) Double glazed window to rear aspect, built-in double doored wardrobe with glazed doors, radiator, power points. FAMILY BATHROOM White suite comprising; double ended bath with central filler, close coupled w.c., with twin flush, wash hand basin with mixer tap and cupboard space under, ceramic tiled to half wall level, tiled flooring, heated towel rail, ceiling spotlights, double glazed frosted glass window to rear aspect. BEDROOM 4 10' 2" x 8' 7" (3.1m x 2.59m) Double glazed window to front aspect, wood laminate flooring, radiator, power points. TOP FLOOR Door leading from first floor landing with staircase. BEDROOM 2 16' 0" x 9' 7" to front of built-in wardrobes (4.88m x 2.92m) (13'5" max) Low level built-in wardrobes to one wall with hanging space and shelving to one end, measurements taken from approximately 3'2" off floor level with eaves to side ceilings restricting headroom, maximum ceiling height 7'9", Velux skylight window to front aspect, power points, double glazed window to rear overlooking garden and gardens of adjacent properties, power points. OUTSIDE To the front is a lowered kerb leading to shingle car hardstanding area, pathway leading to arched porch and main front door. To the rear, accessible from the kitchen/dining room are twin wooden steps leading down to a westerly facing patio area leading on to further decked area and false grass garden, enclosed by fence panelling on both sides with raised flowering borders, external electric power points, to the western end of the garden is a detached family room/gym. BUILT-IN STORAGE CUPBOARD 8' 11" x 5' 5" (2.69m x 1.52m) Electric lighting.